The European gas market in recent years is characterized by rising demand amidst falling domestic production. After a decade of declining demand, gas consumption in OECD Europe is, since 2014, increasing again. In 2016 the level of gas consumption was around 12% higher than in 2014. The increase is being driven by continued economic recovery and additional gas use in the power generation sector. The lower gas price combined with a steep increase in coal prices allowed gas to compete with coal for power generation in some parts of Europe. 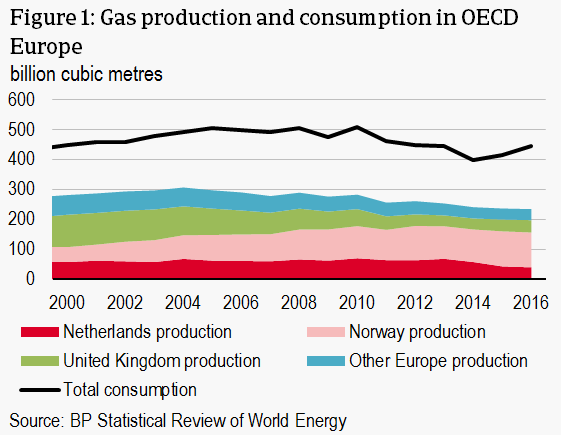 Gas production in OECD Europe has been declining in recent years. The Netherlands and the UK, the largest fields on the continental shelf, are to a large extent responsible for the decline (Figure 1). The pick-up in production in Norway in recent years was not sufficient to offset the decline in the Netherlands and the UK. Gas production in the Dutch Groningen field has been capped since 2014 due to seismic activity linked to gas extraction. The production cap has been increasingly tightened over recent years. In the period up to 2022, OECD Europe’s import requirements – the difference between consumption and production – is projected to expand from approximately 200 billion cubic meters (bcm) in 2016 to 290 bcm in 2022. Gas demand in Europe is expected to remain approximately flat. Gas is a relatively environmentally friendly fossil fuel, which is why - unlike coal and oil - demand for gas is not declining. On the production side, there is a relatively strong decline of 36 bcm projected between 2016 and 2022. In the Netherlands, the government will further tighten gas production over the coming years from its current level of 40 bcm to below 12 bcm per year in 2022. Gas production in the UK is also expected to decline in the coming years. In Norway, production is expected to plateau at its current level of 117 bcm. Russia is a natural candidate to fulfil European countries gas needs. Russia already is the largest producer in Europe. In 2017 Gazprom – the state monopoly gas producer - supplied 192 bcm of gas to Europe (most of the EU plus Turkey). This is up from 159 bcm in 2015. Russia’s gas export industry was built on an intricate network of pipelines to European countries. A recent development is that Russia is also developing Liquefied Natural Gas (LNG) facilities, the first shipment of which was received in Q4 of 2017. Russia provides relatively cheap gas and has approximately 150 bcm of spare production capacity. The only new medium-term pipeline alternative to Russian gas is the Southern Gas Corridor, which connects Europe to gas fields in the Caspian Sea. The Southern Gas Corridor is expected to become available around 2020 and offer a cost-competitive alternative to Russian gas. However, the capacity of the Southern Corridor is not sufficient to plug the growing production shortfall. Another alternative is LNG imports from major producers such as the United States, Australia and Qatar. The gas market is gravitating towards a more market-based pricing system, with a pivotal role for the US given its large resources and production flexibility. Europe is well-placed to import more LNG. It has sufficient regasification capacity: around 230 bcm annually, with a current utilization rate of 20%. The share of LNG in European gas imports is expected to rise over the coming decades given the tremendous growth in LNG export capacity in the US and Australia. However, LNG is normally more expensive than pipeline gas and therefore unlikely to replace Russian gas. As the alternatives are limited (insufficient capacity of Southern Gas Corridor, relatively expensive LNG) we do not expect Russia to lose its dominant position on the European market. But there are concerns about energy security. On the EU-level there is already a growing dependency on Russian imports: in 2016, imports from Russia covered 36% of EU gas consumption, up from 24% in 2010. On the country level this dependency is even clearer: some European countries depend completely on Russia for their gas consumption (Figure 2). Countries that are very dependent on Russian gas supplies – more than 80% of consumption – are the Baltic States, Finland, Slovakia, Czech Republic and Bulgaria. High dependence leaves countries vulnerable to supply disruptions, whether caused by political or commercial disputes, or infrastructure failure. Czech Republic and Slovakia are somewhat better positioned than the Baltic States and Bulgaria due to better infrastructure integration with other EU countries. However, all countries in Central and Eastern Europe (CEE), to a greater or lesser extent, are vulnerable. On two occasions gas supply to CEE was disrupted. This was in 2006 and 2009 when a gas dispute between Russia and Ukraine emerged and supply of Russian gas through the Ukrainian Brotherhood pipeline (Figure) was disrupted, leading to serious shortages in several CEE countries. We do not think that the growing reliance of Europe on Russian gas imports constitutes a security threat. It is understandable that in the context of deteriorating political relations, some European countries are worried about the stability of Russian gas supplies. However, so far both Russia and the western powers have been fairly successful in keeping geopolitical conflicts out of gas trade. Russia also has a financial incentive to keep a steady flow of gas to the European market. It depends on Europe for 90% of its gas exports. Russia is looking to diversify export options, as is evidenced by its development of LNG facilities and the construction of the ‘Power of Siberia’ pipeline into northeast China. But Europe will remain its most important market for the foreseeable future. On the European side, the large underutilized regasification capacity for LNG serves as a backstop to possible supply disruptions or attempts by Russia to abuse market power. This LNG capacity can be deployed in a relatively short period to reduce any gas shortages.